When news broke of the rumoured $70 million sale of the 1963 Ferrari 250 GTO number 4153 GT, it quickly became clear that the new owner is David MacNeil (picture above, middle). But who is David MacNeil? His company WeatherTech, a producer of vehicle accessories, is now main sponsor of the Laguna Seca circuit in California, as well as the IMSA SportsCar series. MacNeil himself is an experienced sports car racer and car collector. He also owns the WeatherTech Racing team, which will compete in the year’s Le Mans 24 Hours. MacNeill recently exhibited his beautiful Ferrari 250 GT California Spider at Pebble Beach Concours d'Elegance. It looked so good that it made it into our top 15 cars of the concours. Which are the most expensive cars ever sold? Is this the most valuable British car? David MacNeil’s success story really began in 1989, when he re-mortgaged his house for $50,000 to start a business importing automotive floor mats from the UK to the USA. While working as vice president of US sales for AMG he had previously noticed that the quality of mats fitted to luxury vehicles was poor, and while on holiday in the UK he spotted that the quality of certain UK-made mats was much higher. After a few years he began to manufacture his own mats in the USA, under the WeatherTech name, and the company has since expanded to produce other accessories such as boot/trunk liners, pick-up bed liners, mud flaps and seat protectors – as well as a pet feeding system said to protect animals from harmful toxins, prompted by the death from cancer of three of MacNeil’s dogs. MacNeil is very vocal in encouraging other companies to manufacture in America, as WeatherTech does, and famously ran an advert at the 2014 Super Bowl to hammer home the message. The ad showed an entrepreneur who succeeded despite supposedly defying the odds by manufacturing in the USA. Aside from WeatherTech, MacNeil raced for many years, even competing in the 12 Hours of Sebring, but then took a break to concentrate on flying from the early 2000s. 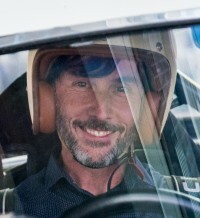 Once he’d attained the top-level Airline Transport Pilot certificate, he returned to racing in 2007 – and now his son Cooper races too, and is one of the team's Le Mans drivers. He also races a Ferrari 488 Challenge, and made his Daytona debut in it earlier this year.